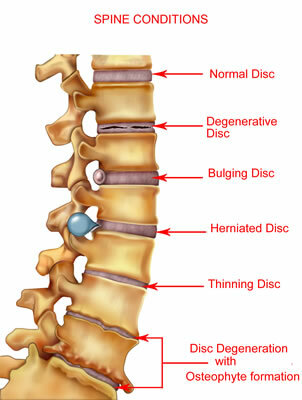 A “bulging disk” means just that, it is bulging outside of its normal space between two vertebra. In doing so, the disk may push against a nerve, causing pain. Bulging disks are caused by two common problems: either the natural aging (degenerative) process or from trauma. A related condition is Cervical Disk Disease or cervical disk herniation. During the normal aging process, wear and tear on a disk occurs, leading to a drying out of the internal gel-like nuceleus pulposis, and with it, a loss of disk height occurs. The normal separation between the vertebral bones is lost, resulting in a bulging effect. This is like losing air in a car tire and as a result, the tire bulges under the weight of the car. The second common cause for a bulging disk is when the outer ring layer of ligaments becomes torn during trauma. This can create an area where the inner nucleus can migrate outwards and, as a result, an outward bulge in the disk can be seen. What’s the difference between a bulging disk and a herniated or ruptured disk? With a bulging disk, the inner gel-like nucleus is still contained within the disk by the outer ring of annulus ligaments. With a herniated or ruptured disk, the outer ring of annulus ligaments is ruptured, allowing the nucleus to “leak out” irritating nerves and causing pain. To complicate our understanding of bulging disk and disk herniations, images of the disk from an MRI or other imaging study, are static pictures of the anatomy. Pictures don’t hurt, nor do they identify where pain is located. Individuals without pain can have abnormal MRI scans with bulging and herniated disks. For this reason, a skilled physician must evaluate the patient to determine the source of pain and correlate that with imaging studies. Relying solely on pictures to diagnosis pain, especially when evaluating bulging disks, often leads to misdiagnosis and lack of improvement in the patient. Rest if there is severe pain. Otherwise, stay active. Staying in bed for more than one or two days can weaken muscles and make the problem worse. Walking and other light activity may help. Try using a heating pad on a low or medium setting, or a warm shower, for 15 to 20 minutes every couple of hours. You can also try an ice pack for 10 to 15 minutes every 2 to 3 hours. Do the exercises that your doctor or physical therapist suggests. These will help keep the back muscles strong and prevent another injury. Ask your doctor about medicine to treat your symptoms. Medicine won’t cure a bulging disk, but it may help with pain and swelling. A bulging disk can also be treated with non-steroidal, anti-inflammatory medication if the pain is only mild to moderate. An epidural steroid injection may be performed using a spinal needle under x-ray guidance to direct the medication to the exact vertebral level of the bulge. The medication will help relief pain and swelling. Your doctor may also recommend physical therapy. The therapist will perform an in-depth evaluation, which, combined with the doctor’s diagnosis, will dictate a treatment specifically designed for patients with bulging disks. If you continue to suffer with a bulging disk and your current treatment plan leaves you feeling hopeless, perhaps a fresh set of experienced eyes can change your outlook. Since 1990, Dennis M. Lox, M.D has applied his personal interests in sports medicine, cutting-edge regenerative medicine and chronic pain management to helping patients increase their quality of life. Contact us for an appointment at 727-462-5582.